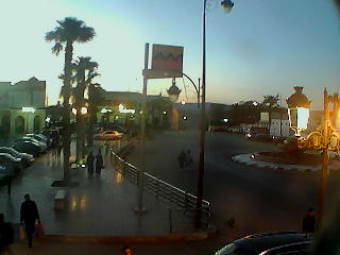 It's 10:15 in Taza, Morocco right now. Place Aherrach View of the Place Aherrach, Taza, Maroc. From 9:00 to 20:00. Ifrane: Al Akhawayn University, 79.1 miles away. Ceuta: Port of Ceuta, 138.3 miles away. Tangier: HD Stream over Tangier, 149.6 miles away. Gibraltar: View over Gibraltar, 154 miles away. Gibraltar: Frontier Queue Live Cameras, 154 miles away. Gibraltar: Gibraltar Cable Car, Top of the Rock, 154 miles away. Fuengirola: HD Livestream Paseo Maritimo, 164.8 miles away. Fuengirola: HD Stream Plaza de la Constitución, 164.8 miles away.